Broward Children’s Center (BCC), located in Pompano Beach, FL, serves infants, children, and young adults who are medically fragile and are dependent on technology. This includes a broad range of children with special needs, including individuals with traumatic brain injuries, autism, down syndrome, and other congenital diseases. BCC was founded in 1971 by current CEO, Marjorie Evans. It opened under the name Broward Captivated Child Care and was initially established to provide services to children with profound disabilities for up to six hours a day. Throughout the 1970’s, the program progressed from 6-hour days, to 12, and eventually became a 24-hour care facility. Broward Captivated Child Care was the first program of its kind in the Southeast region of the United States and operated as a residential habilitation center serving 25 children. Broward Children’s Center has since grown from a single-program establishment to one that serves over 1,200 infants, children, and young adults – many who require a very high degree of complex medical care. The programs offered at Broward Children’s Center are designed to meet the medical, educational, social, psychological, and recreational needs of those served in all stages of development. BCC programs include children’s comprehensive care center, group homes, applied behavior analysis, therapy, prescribed pediatric extended care, coastal care home health, education, and social services. The Children’s Comprehensive Center is the only free-standing sub-acute skilled nursing facility in the southeast region of the United States, and offers short and long-term care, medical, education, psychological, and recreational services to each patient. Other services include: ventilator weaning and replacement, I.V. therapy, diaphragmatic pacing system, and TPN, among others. On Saturday, November 3rd, BCC will hold their 15th Annual Miles for Smiles walk and run. Community participants gather each year to support the mission of BCC – to help children with special health needs live life to the fullest and improve their quality of life. The funds raised at this event support the medical, educational, therapeutic, and recreational services provided by Broward Children’s Center for infants, children, and young adults. 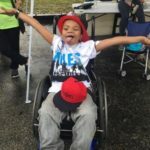 For more information or to get involved with Miles for Smiles, visit bcckids.org/milesforsmiles.